When I was in my 20s, I imagined a glamorous career that took me to big cities and beautiful places. I wanted to experience the world via planes, trains and automobiles, rub elbows with famous people and dine at chic restaurants, clinking glasses with witty and interesting people. That’s not exactly how it worked out. Oh, there is plenty of travel. But as you know, travel isn’t all that glamorous anymore. Airports are among the most unhealthy places in the country, over-crowded by hurried and often distraught travelers, abysmal, heart-attack-inspiring food, mind-numbing delays and nowhere to sit. Big-city cabs are atrocities on wheels. They smell terrible and there is always a spring in the seat sticking up into my bum. More than once I have questioned my good judgment for getting into a car with one of these dangerous and dangerous-looking men. A good hotel can be a small oasis of sanity, but it’s still a hotel. And you don’t get to pick your neighbors. How many amorous couples, giggling girls and drunken good-old-boys have I had to share a wall with? Yes, I am the kill-joy who knocks on the door at 2 a.m. and explains that she has to get up at 5:30 a.m. for work. To travel, I must also leave the serenity and quiet of my country home. I have put the care of my little dogs and pet chickens and the watering of my fragile container plants in the hands of my husband and son. God only knows what devastation occurs while I’m gone and gets tidied up before I find out about it. 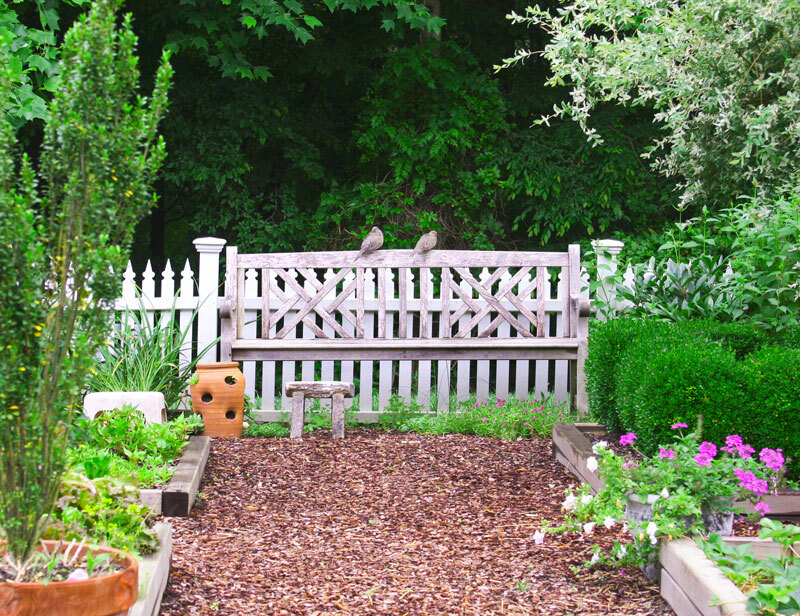 Mourning doves prettily perch on the garden bench. They kindly waited while I snapped their photo. Although the travel isn’t easy, I will admit though that the people are worth the effort. For example, among other recent travels, I headed to Chicago for the Garden Bloggers Spring Fling, where I had a fabulously good time rubbing elbows with some of the most interesting people I know–other garden bloggers. “So where are all your fabulous photos from Spring Fling?” you ask. Well, it seems that since I live in a rural area and don’t get to socialize all that much with other gardeners, I completely lost my head and forgot to take photos. Oh yes, I have a few photos from the Chicago Botanic Garden and a few other places, but not so many of my old and new gardening friends. So if you weren’t there yourself, head on over to the official Spring Fling website and see who was there. Next year our Spring Fling will be in Buffalo, New York. Will someone please remind me to stop talking and take some photos?